Here at Complete Home Solutions, we believe in showing our community just how much they mean to us through charitable donations and support of local events. 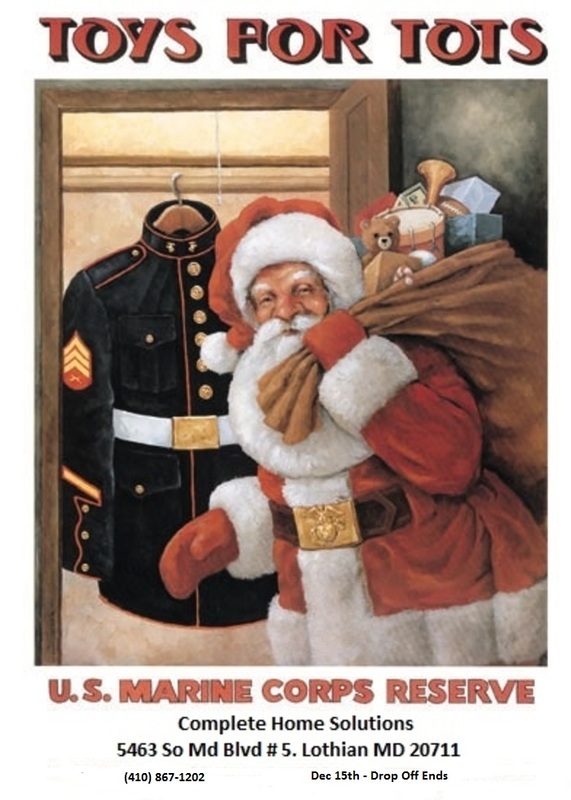 The Toys for Tots Program is hosted every year by the U.S. Marine Corps Reserve in order to provide less fortunate children with new, unwrapped presents for Christmas. The goal of this program is to deliver a message of hope to those children and eventually play some hand in them becoming responsible, productive, patriotic citizens. This Christmas season, Complete Home Solutions was able to assist in delivering this truly meaningful message. We received the official “Toys for Tots Box” in November and began rallying our office and community together to gather presents. By December 16th, the pick-up date, we were thrilled by the number of gifts collected! It was a great feeling to have helped so many children in our community. After a successful first year, we now have even bigger goals for next year! The St. James' Parish Church hosts their annual Holiday Dinner Charity Event on November 19th, 2016. Local businesses participate by donating various foods for needy families - foods generally include stuffing, fresh vegetables, turkeys, canned goods, etc. This year, the church gathered enough food to provide for about 80 families in the Lothian community. The food is collected by Friday and volunteers come in on Saturday to both organize the dinner bags and to deliver them to the families' cars. This is the first year that Complete Home Solutions has participated in the charity event, but we hope to continue to participate from here on out. We were able to contribute 25 turkeys to the cause and dedicate a handful of employees to volunteer. We were happy to help so many families in our community! The Breakfast Club is a summer program coordinated by Mt. Zion United Methodist Church, providing a free breakfast to children in South County. Breakfast bags (with a different “menu” for each day) are handed out Monday through Friday. On Friday larger bags of groceries are given to any family who wants one. During the summer of 2015, a total number of 5,551 breakfast bags were handed out. Along with several church groups, Complete Home Solutions delivers bagged meals during the summer to two mobile estates in the area. Every Friday during the summer we send two of our employees to help with picking up items from Sam's Club. The kids wake up bright and early to get their breakfasts. They eagerly take their bags, and some children even check their bags right away to see what they have! Membership fees, donations and fundraising help the Southern High School Sports Booster to provide soccer goals, baseball & softball batting cages, field house lockers, field house maintenance and press box improvements, student fan busses to State Championship games, state championship jerseys for the players, family ID software programs and much more! Complete Home Solutions supports the SHS Sports Boosters whenever we can. We recently sponsored a tee hole at the 7th Annual SHS Sports Boosters Golf Tournament and donated water bottles to be distributed in gift bags. We also support other Sports Boosters events throughout the year such as the Annual Bull Roast and more. South County Assistance Network (SCAN) was established in May of 1997 for the purpose of providing supplemental, nonperishable food to those in need in South Anne Arundel County. Currently the SCAN food pantry is distributing food to over 150 families. 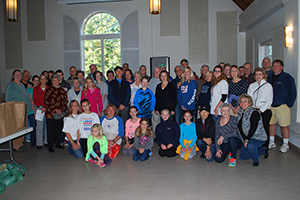 The pantry is located in the lower level of the Education Building at St. James Episcopal Church in Lothian, Maryland. Food is distributed on Thursdays and Saturdays from 9am to 12pm, excluding holidays. The United Way of Calvert County's Annual Golf to Give Tournament raises funds to support local programs that improve the education, income and health of people living in Calvert County. Last year's tournament attracted over 125 golfers, comprised of local business owners, non-profit leaders and dignitaries. Complete Home Solutions hosted an interactive tee hole, sponsored a tee and gave out water bottles and other give-a-ways! Complete Home Solutions is a Silver Level Sponsor of the Quacks for Backpacks rubber duck race and family carnival to support the Bountiful Backpack Program through the Rotary Club of South Anne Arundel County. The program helps feed children over the weekends when they aren't at school. By providing several food items sent home via backpacks, the hope is that these children will not go hungry over the weekend. In support of National Autism Awareness Month and to help enrich the lives of our neighbors and give back to our community, Complete Home Solutions donated $50 for every project completed throughout the month of April to Autism Speaks. Our goal is to not only raise money but to bring awareness to the challenges faced by the thousands of local families with family members diagnosed with autism! As the new school year approaches, it's that time again to start shopping for supplies. 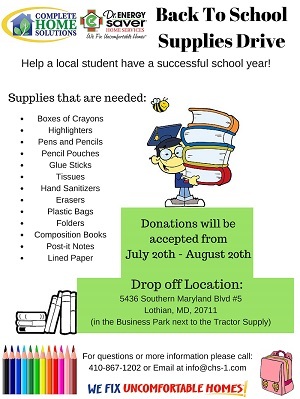 Many families can't afford new supplies for their kids this year and they need your help! 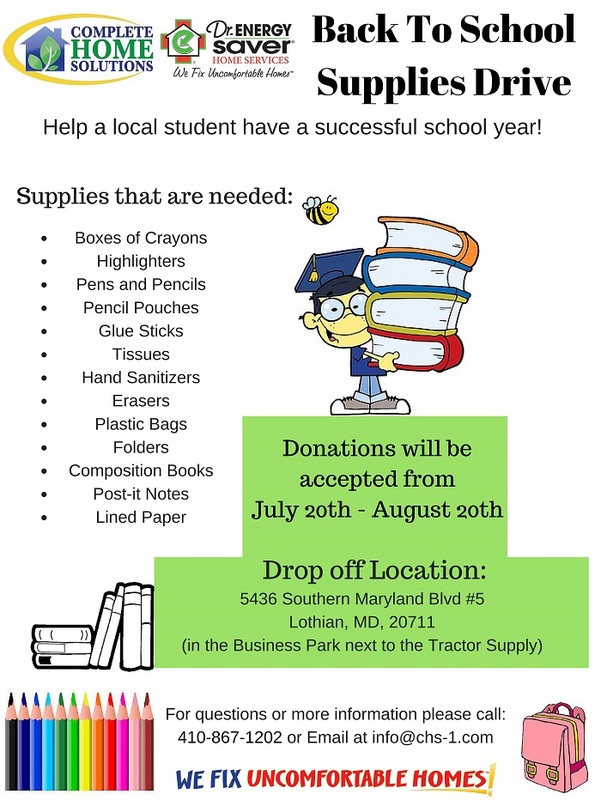 Complete Home Solutions is sponsoring our annual Back to School Supplies Drive from July 20th to August 20th to help send kids in need back to school with the supplies they'll need for success at school. You can drop off simple things like pens, pencils, folders, or highlighters at the Drop Off Box at our office or send in a contribution to our community through our Go Fund Me page. Lend a hand to your community this fall and help our local kids succeed!